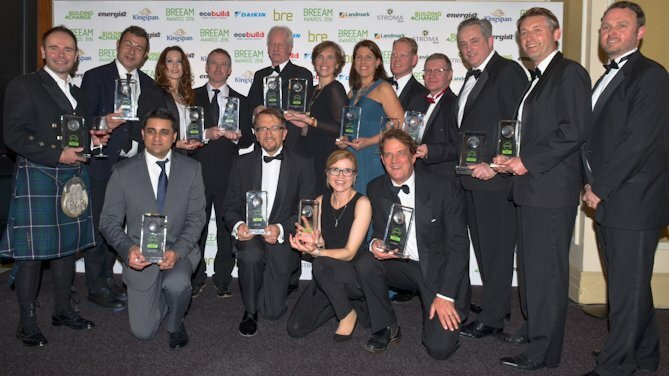 The winners of the BREEAM Awards 2016, the world’s leading building rating Scheme, were announced at a ceremony held last night at the London Marriott Hotel in Grosvenor Square. The winners were drawn from highest scoring buildings in 2015 – under the BREEAM schemes for assessing building sustainability – and include many of the most innovatively sustainable buildings in the UK and countries across Europe, including France, Holland, Sweden and Turkey. The awards cover a variety of sectors including residential, retail, industrial education and health care as well as project types such as new build, refurbishment and in use. Also receiving awards on the night were design and engineering consultancy Grontmij, who were announced as BREEAM Assessor Company of the Year with individual Assessor of the Year awards given to: James Warne, Boom Collective, Kartik Amrania, Grontmij and Magdalena Krause, CH2M Hill. PhD student at University of Reading Mitchell Curtis was the recipient of the first BREEAM New Talent Award which recognizes the most successful students in the BREEAM Accredited Graduate (AG) course. The coveted and highly competitive people’s prize – the Your BREEAM Award - which gives members of the public the chance to vote for a BREEAM building they love, was given to OVG Real Estate for The Edge in Amsterdam.